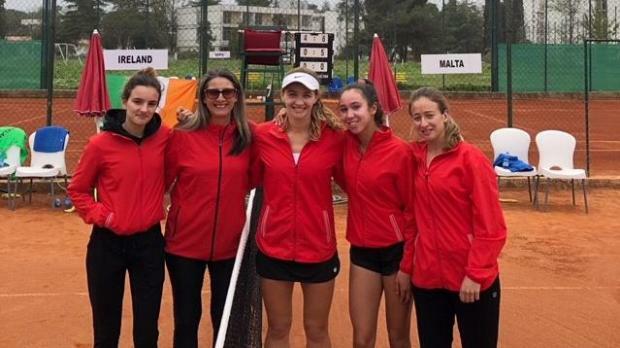 The Tennis' women's team, comprised of Elaine Genovese, Brenda Galea, Francesca Curmi and Emily Lightfoot, has started its Fed Cup commitments with a 3-0 win over Ireland. Curmi was first on the court and she managed to overcome Jane Fennely 6-1, 6-2. Genovese followed with another victory against Amy Bowtell, claiming the game in two sets; 6-1, 6-2. Curmi and Genovese joined forces in the doubles game and they managed to beat Bowtell and Fennely 6-4, 6-0. Malta's next ties in Group B, Pool B for Euro/Africa Group III will be against Morocco and Uganda.